How Do Chiro & Physio Differ? So here goes: Yes, dear sir, listen to your wife. Slouching is bad. It’s bad not only for your physical health, but also for your emotional and social well-being. More about this in a bit. Without delay, get that computer on a proper surface (laps can encourage slouching) and get a supportive chair that enables you to sit up straight with your head aligned directly over your shoulders and hips when your eyes are on the screen. As a short person who is prone to back pain, I have long been aware of the value of good posture, and seating that minimizes the stress on my spine and the muscles and ligaments that support it. I know within seconds of sitting in a car whether it will hurt my back or neck; when renting, I test car after car until I find one that suits my diminutive frame. I bought my current vehicle, a Toyota Sienna minivan, largely because I was immediately comfortable when I got behind the wheel for a test drive. My entire back was supported, so not a twinge was felt there, unlike what happens in many other cars. I could also easily see over the steering wheel without tilting my head back, which is not the case in most other vehicles. And I could reach the floor pedals without unduly extending my leg and straining my lower back. Poor posture can have ill effects that radiate throughout the body, causing back and neck pain, muscle fatigue, breathing limitations, arthritic joints, digestive problems and mood disturbances. It can also create a bad impression when applying for a job, starting a relationship or making new friends. Poor posture can even leave you vulnerable to street crime. Many years ago, researchers showed that women who walked sluggishly with eyes on the ground, as if carrying the weight of the world on their shoulders, were much more likely to be mugged than those who walked briskly and purposely with head erect. I can’t prove posture was at fault, but this is indeed what happened to a Brooklyn neighbor on her way home one night. We live in a gravitational field, and when our bodies are out of line with the vertical, certain muscles will have to work harder than others to keep us upright. This can result in undue fatigue and discomfort that can outlast the strain that caused them. In a study of 110 students at San Francisco State University, half of whom were told to walk in a slumped position and the other half to skip down a hall, the skippers had a lot more energy throughout the day. Any repetitive or prolonged position “trains” the body’s muscles and tendons to shorten or lengthen and places stress on bones and joints that can reshape them more or less permanently. Just as walking in high heels can shorten and tighten the Achilles’ tendons and calf muscles, slouching while sitting hour after hour can result in a persistent slouch, while standing and walking while slouched can lead to permanently rounded shoulders and upper back. Although early humans spent most of their waking hours walking, running and standing, today in developed countries, 75 percent of work is performed while sitting. 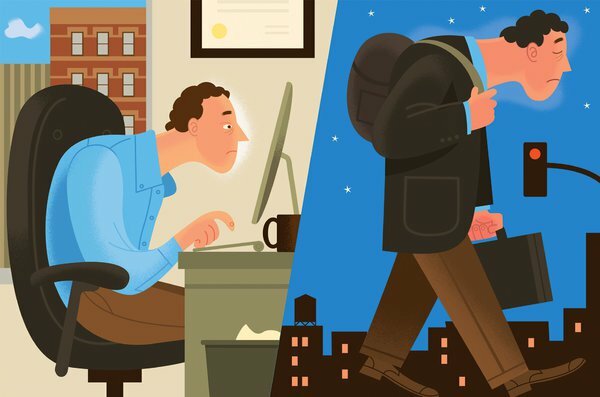 Most people sit going to and from work and while relaxing after work. The longer people sit (or stand) without a change in position and movement, the more likely they will be to develop a postural backache, according to a report in The Journal of Manipulative and Physiological Therapeutics. Leaning forward or slouching can also reduce lung capacity by as much as 30 percent, reducing the amount of oxygen that reaches body tissues, including the brain, according to Dr. Rene Cailliet, a pioneer in the field of musculoskeletal medicine who died in March. Additionally, slouching or sitting in a scrunched position compresses the abdominal organs and may reduce peristaltic action that is important to normal digestion and bowel function. One of today’s most troublesome activities, especially for children and adolescents whose bone structure is still developing, is carrying extraordinarily heavy backpacks to and from school and often throughout the school day. The weight forces them to bend forward, with potentially the same consequences as slouching. It is time to return the rolling backpack to youthful fashion. I have used one to lug heavy files and books back and forth to work since these packs were first invented as an outgrowth of the wheeled luggage that came into vogue in the 1980s. For far too many years, I carried everything, including a heavy briefcase and groceries, over my right shoulder, which forced me to raise that shoulder and lean toward my left, clearly an undesirable posture. When carrying heavy items is unavoidable, it is best to balance them on both sides of the body. Among other postural habits to avoid are these, listed by Britain’s National Health Service. Standing with a flat back, with the pelvis tucked in and lower back straight (the normal spine has three curves – in the neck, chest and lower back). Standing with chest pushed forward and buttocks pushed back (the so-called Donald Duck posture that exaggerates the lumbar curve). Leaning on one leg, which puts undue pressure on one side of the lower back and hip. Bending the head back and sticking out the chin while looking at a computer screen or television. Instead, lower the screen or raise the seat. Holding the phone on a shoulder. Instead, use a hands-free device like a headset or Bluetooth. Improving posture requires a conscious effort and often strengthening and flexibility exercises to correct muscular imbalances, according to Nick Sinfield, a British physiotherapist. For example, exercises that strengthen the core, buttocks muscles and back extensors help correct a slouching posture, he said. Live Well Chiropractic is conveniently located in both Sydney’s CBD and Chatswood.